Operating in 1968 as Tambellini’s Gate Theatre, screening independent movies. This small cinema was opened in March of 1977 for the purpose of showing recent and classic foreign and independent American films of merit. Named after the great French film director, the cinema was carved out of a theatre space in the East Village called the Gate Theatre Center. The opening night program was a revival of Renoir’s 1934 “Toni”. Additional information from patrons who remember this place would be appreciated. Thanks for posting your memories of the Jean Renoir, Ray; what was its exact street address? The Camelot Twin, listed elsewhere on this site, was reported to have existed at 2nd Ave. and 10th. Could it have used this space five years earlier? The Gate Theater which, along with its alternate name, Tambellini’s Gate Theater, should be listed as Previous Names for this theatre, was mostly used as an Off Broadway venue. It was located, along with the Cricket Theater (AKA Cricket Playhouse), another live venue, in the former Second Avenue Baptist Tabernacle building (erected in 1909, replacing the original church structure which had been built in 1849), a 14-story structure at 162 Second Avenue, New York, NY 10003. One theater was in the basement and the other on the 1st floor. The auditoriums apparently seated 135 and 250 persons, though COs for the property report capacity as 165 and 350. 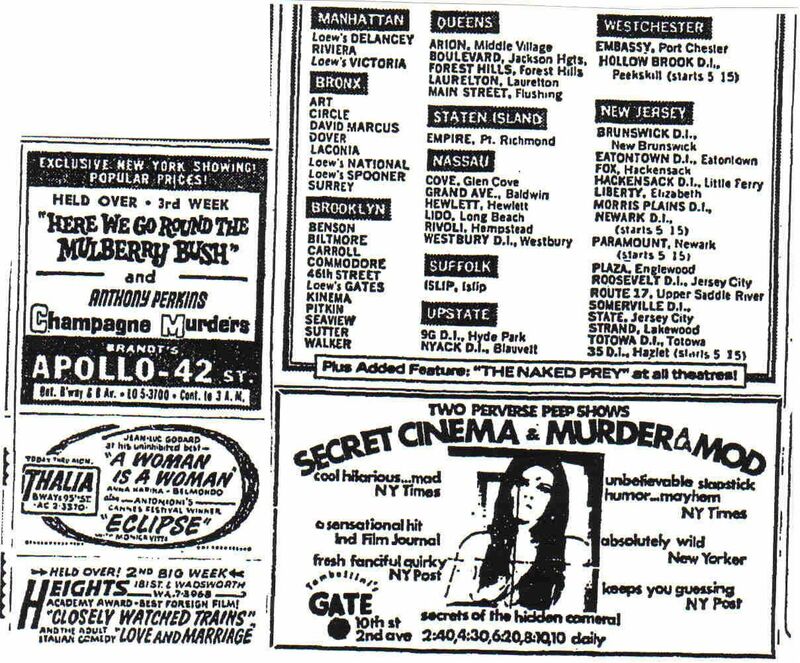 In the later half of the 1960s, the Gate Theater screened many underground, experimental, and short films, including, in 1964, Martin Scorcese’s “What’s a Nice Girl Like You Doing in a Place Like This?” In December 1977, the location became home to the Theater for a New City. Today, the structure is home to Urban Outfitters. Here is an ad as The Gate. If indeed the Gate, Camelot Twin and Jean Renoir are all the same, the address is: 162 Second Avenue. The first commercial festival of Cuban films was held at the Olympia in March 1972 way before the Jean Renoir opened. It lead to the commercial release of the now classic MEMORIES OF UNDERDEVELOPMENT. 100 7th Avenue So. Nr. Sheridan Square. As the late, quite remarkable Ray Blanco explains above, the Jean Renoir Cinema originally opened at 162 Second Avenue, then was forced to move to the Actors Playhouse at 100 7th Avenue South due to landlord problems. A plumbing crisis at the second location was the last straw, and the cinema closed for good at the end of 1977. I was there, and it was quite a year, full of ups and downs. The Gate showed movies here for two years (1967-68), probably longer than the Jean Renoir or the Camelot ever operated. Gate should be added as an aka and 162 Second Avenue should finally be added as the best likely address.